MATSUI, Doris, (wife of Robert Matsui), a Representative from California; born in Poston, La Paz County, Arizona, September 25, 1944; B.A., University of California, Berkeley, Calif., 1966; staff, transition team for President-elect William J. Clinton, 1992-1993; deputy assistant, Office of the Public Liaison, President William J. Clinton administration, 1993-1998; professional advocate; elected as a Democrat to the One Hundred Ninth Congress, by special election, to fill the vacancy caused by the death of her husband, United States Representative Robert Matsui, and reelected to the seven succeeding Congresses (March 8, 2005-present). Oral History: 2003-2011, .8 linear feet. The Asian Pacific Americans in Congress oral history collection contains video interviews conducted by the United States Capitol Historical Society. It documents Asian and Pacific Islander service in Congress, discussing work in the House and Senate, as well as significant historical events that shaped those interviewed. In addition to the interview media, the collection includes: interview transcripts, photographs, correspondence, press releases, and research and production files. "Doris Okada Matsui" in Women in Congress, 1917-2006. Prepared under the direction of the Committee on House Administration by the Office of History & Preservation, U. S. House of Representatives. Washington: Government Printing Office, 2006. 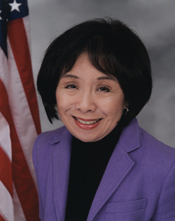 "Doris Matsui" in Asian and Pacific Islander Americans in Congress, 1900-2017. Prepared under the direction of the Committee on House Administration by the Office of the Historian and the Office of the Clerk, U.S. House of Representatives. Washington: Government Publishing Office, 2018.